Kerala VHSE Third Allotment Result / VHSCAP 3rd allotment 2018 for admission to Kerala VHSE Plus One courses for 2018-2019 has published on 21-07-2018 at www.vhscap.kerala.gov.in . This is the final allotment in the main allotment process of VHSCAP Single Window Admission in VHSE courses 2018-19. 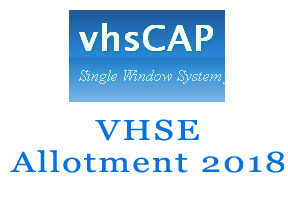 The candidate who is waiting for the 3rd allotment in VHSE can check their VHSCAP allotment status from the web site. VHSE Third Allotment / 3rd Allotment is the final allotment in the VHSCAP main allotment process for admission to VHSE courses in kerala. VHSE already completed first and second allotment process and most of the candidates get admitted in VHSE seats in various schools. The VHSCAP Third Allotment result will be important for the students who are still waiting for VHSE allotment or waiting for a better allotment in their options. The allotted candidates in the third allotment result must have to take the permanent admission in the concerned schools. The candidates who continue with temporary admission should have to take the permanent admission in this allotment period. The allotted candidates need to report to the Principals of the alloted schools along with the required documents in original. They must pay the required fee for admission. The candidates who are still in the temporary admission need to take permanent admission in the alloted school. If the candidates failed to take the permanent admission will lose their chances to get admission this time. This is the final allotment in the main allotment process of VHSCAP 2018. The candidate who are not included in the main allotment process or in the third and final allotment will have option to apply for supplementary allotment. This option will also be available for fresh candidates. VHSE supplementary allotment process will be start after the 3rd allotment. The candidates who did not get allotment in the mian allotment process or the candidate who got allotment but not received the admission can apply for VHSE supplementary allotment. The CBSE school exam passed candidates will be eligible for apply for the VHSE supplementary allotment. The supplementary allotment date will be announced later.